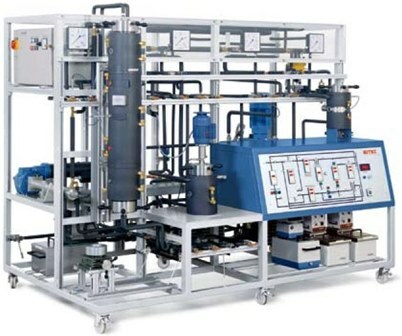 Supercritical Fluid Extraction can be used to generate a finely controlled stream of micro particles. The desired substrate is solubilised in the supercritical fluid and transported to an orifice where the sudden expansion of carbon dioxide creates a stream of nano-micro particles. 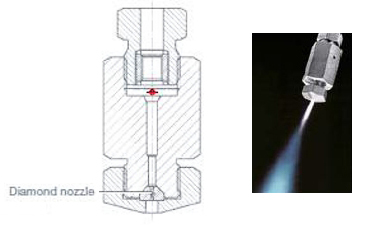 Control of orifice shape, temperature and pressure differential are used for definition of particle size and morphology. Unimodal particle size distributions with the pulsation free pump. Creation of fine particles without thermal and chemical degradations. Contamination free recirculation of supercritical solvent. Diamond orifices with diameters from 15 to 300 microns. Particles are created either by the RESS (Rapid Expansion of Supercritical Solutions) or GAS (Gas Anti-Solvent Recrystallization). Examples of RESS include bioerodible polymeric microspheres loaded with a therapeutic drug; chemical phase change ie PVDF α to β form. Examples of GAS include Creation of fine powder explosives such as RDX cyclotrimethylenetrinitramine ; crystallization of aspirin; production of colour pigments.